Hi there! A couple of months ago, I was asked by Emily and Ashley (the sisters who write the blog Frances Suzanne and Flip this pattern), if I would like to take part in a spin on the monthly flip this pattern series. This month Ashley and Emily are hosting September Showcase. The idea behind this month is to promote small indie pattern designers (with five or less patterns) and to share what you have sewn (flipped or not) over at Frances Suzanne (all the details are in the link above). 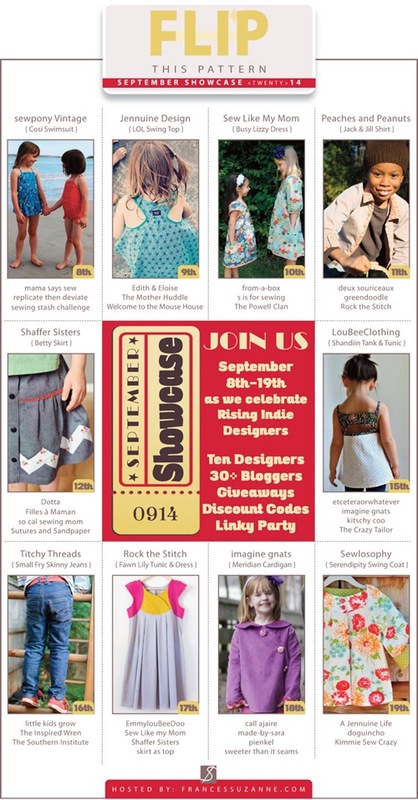 There will also be bloggers showcasing a heap of patterns from indie designers (my cosi pattern included). This is not a competition, more a sharing month...but here are prizes!! Until September 20th you can receive 20% off my patterns with the code: SHOWCASE20. You can also enter the rafflecopter widget below to be in the winning for a tonne of free patterns!!! Good luck! And thank you Ashley and Emily for inviting me to take part!